Unauthorized use of the EPA logo: Wheelabrator implies that the U.S. Environmental Protection Agency supports them by using the EPA logo without permission. EPA’s logo may not be used without permission, and EPA has confirmed that this is an unauthorized use and has forwarded the information to their Office of General Counsel. The Maryland Office of Attorney General has also been notified. In fact, EPA’s National Emissions Inventory database shows that Wheelabrator is the largest air polluter in the city, and is responsible for 36% of all pounds of industrial air pollution in the city, three times more than the city’s second largest air polluter, the Grace Chemical plant. The same EPA data shows that the Wheelabrator Baltimore trash incinerator releases 2.3 times as much air pollution as the large King and Queen Landfill in Virginia, where a small fraction of Baltimore trash also goes. 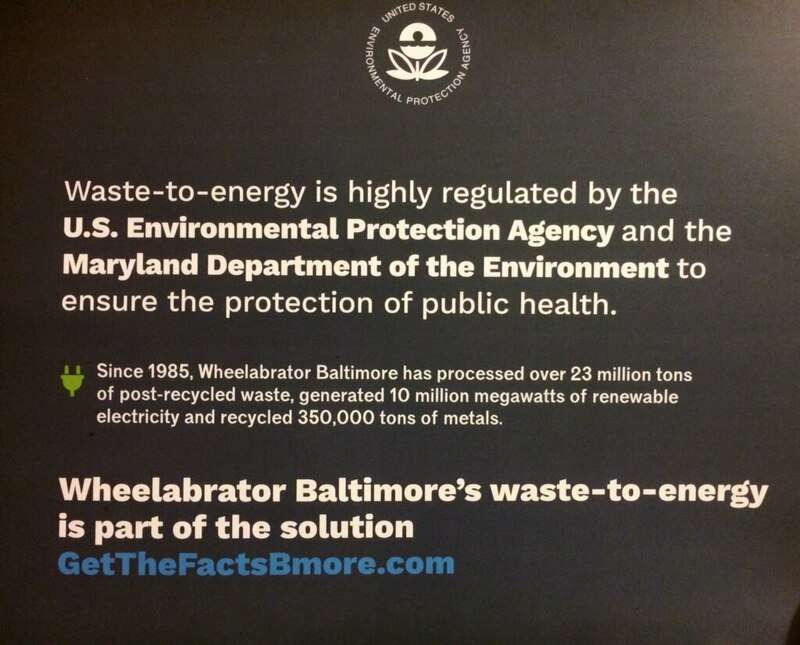 Wheelabrator is 427 times more air polluting than the Quarantine Road Landfill in Baltimore, where their ash is dumped. 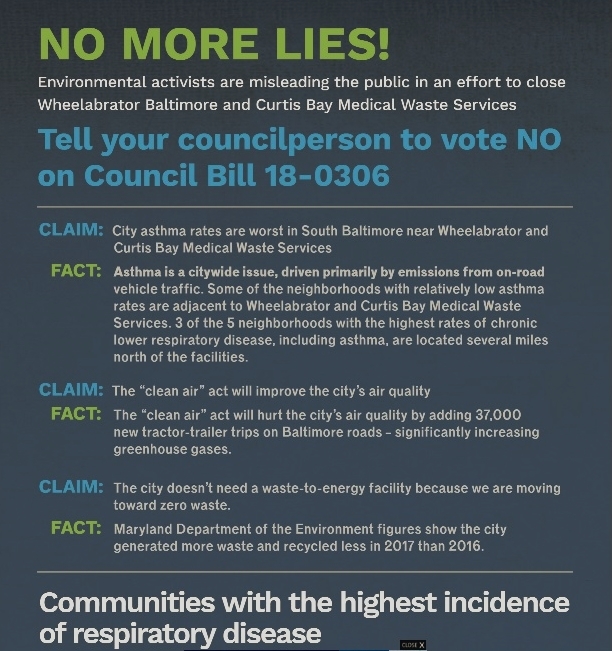 See more about Wheelabrator Baltimore’s air emissions. In terms of global warming pollution, different EPA databases (eGRID and FLIGHT) provide this data, and show that Wheelabrator emits 6.8 times as much global warming pollution as the King & Queen Landfill and 16.6 times as much as Quarantine Road Landfill. Trash incineration “is highly regulated by the U.S. Environmental Protection Agency and the Maryland Department of the Environment.” In fact, the most toxic pollutants released from Wheelabrator, such as dioxins, mercury, lead, and arsenic, are tested just one day a year, by Wheelabrator (not anyone independent), and this testing is done under optimal conditions. Pollution limits are far weaker than a new incinerator would have to meet, and even far weaker than some standards being set for existing trash incinerators. For example, states are currently setting new standards for trash incinerator emissions of the nitrogen oxides (NOx) that trigger asthma attacks. Maryland recent required that Wheelabrator lower their emissions from a recent average of 166 parts per million (ppm) to 150ppm. Virginia is requiring two existing trash incinerators near DC to meet limits of 110ppm. New incinerators are required to meet a limit of 45ppm. 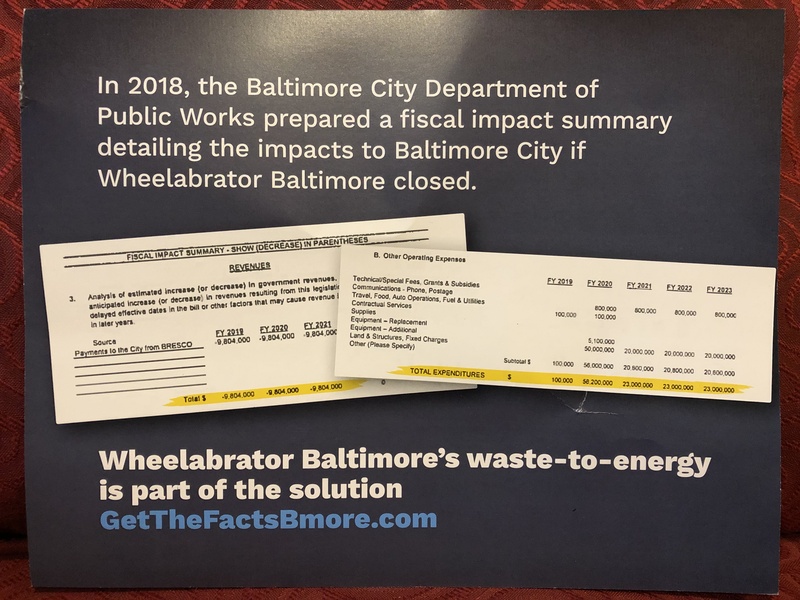 When Baltimore City Council passed a unanimous resolution asking the state to do the same for Wheelabrator, the state ignored the city’s request. That’s one reason why City Council is setting this limit in the Baltimore Clean Air Act. EPA prefers incineration over landfilling because it reduces greenhouse gases by approximately 1 ton for every ton of waste processed. EPA’s own data contradicts this interpretation. So does life cycle analysis of incinerators vs. landfills. In fact, incinerators release more greenhouse gases than landfills because they burn up everything right away, turning nearly all of the carbon into CO2 and injecting it directly into the atmosphere. Plastics and other carbon-containing materials that don’t readily break down (like wood) do not form landfill gas and become sequestered in the landfill. It’s primarily food scraps and yard waste that break down quickly, forming carbon dioxide and methane that can escape. Much of landfill gas is captured and burned, reducing the impacts of the methane releases. …and produces reliable, renewable electricity without relying on fossil-fuel generating facilities. Aging incinerators have been increasingly catching fire, or have to be shut down for maintenance, reducing their reliability. While Maryland and several other states call them renewable due to lobbyist influence, about half of the energy value coming from them is from oil-based plastics (fossil fuels… not renewable). Also, most other materials in our waste stream are not truly renewable. While paper and wood are technically renewable, complex forest ecosystems are not readily renewable. Since trash incineration competes with wind power within Maryland’s renewable energy mandate, if the incinerator closed, BGE would be required to source other Tier 1 renewables – most likely wind power (no fossil fuel allowed). “800 compliance checks each and every day” This may be accurate for the few pollutants that they monitor continuously, as required by the state. Wheelabrator continuously monitors nitrogen oxides, sulfur dioxide, carbon monoxide, and carbon dioxide. None of the toxic pollutants are continuously monitored, but are monitored once per year, if at all. Except for a few air pollutants, they do not know what is coming out of their smokestacks most of the time. If we regulated traffic the same way we do smokestacks, we’d let drivers drive around all year with no speedometer. Once a year, there’d be a speed trap on the highway, with signs warning, ‘slow down… speed trap ahead’ – and the driver’s brother would be running the speed trap, because the companies do their own testing. Wheelabrator was fined several years ago for exceeding mercury pollution found during an annual test. 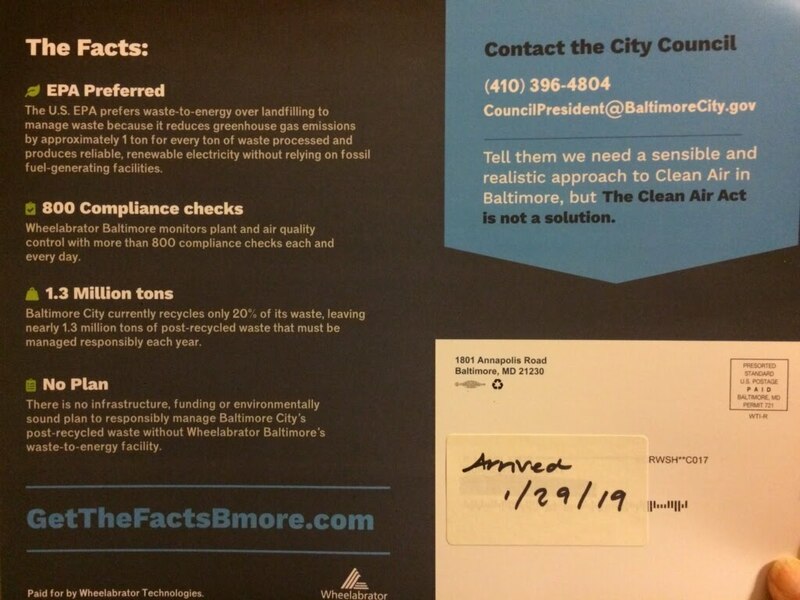 With the Baltimore Clean Air Act, the city can catch them “speeding” during the other 364 days of the year, as it’ll require independent continuous monitoring of 20 pollutants and real-time public disclosure on a website. Baltimore City recycles 20% of its waste. The actual rate is closer to 14-15%. The inflated numbers are because the state permits gives credit for incineration as if it’s recycling. 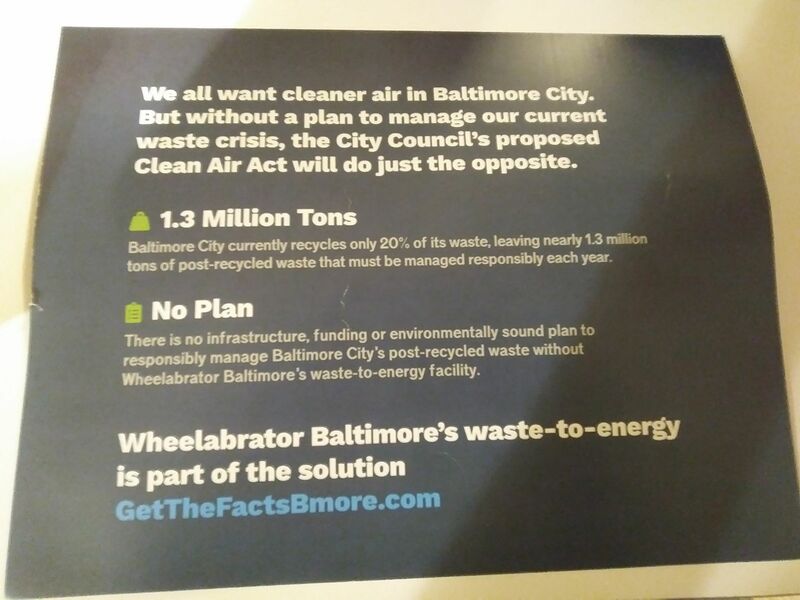 No infrastructure, funding or environmentally sound plan to responsibly manage Baltimore City’s waste without Wheelabrator. In fact, the city has its own publicly-owned landfill in an industrial area in Hawkins Point, which was built in order to accept the toxic incinerator ash. The infrastructure already exists to manage waste just from the city. However, Baltimore has been also filling its landfill with ash produced from trash that comes from 6 Maryland counties and 8 other states. The city has already been working on an expansion of this landfill to provide capacity for at least two more decades. Read more about Life After Wheelabrator: Where will our trash go?? Is this “fiscal impact statement” really from the Baltimore Department of Public Works (DPW)? If so, why do the “Payments to the city from BRESCO” not reflect annual increase in tipping fees at the city’s Quarantine Road Landfill? What year is this supposed impact statement assuming that the incinerator closes? What does the $800,000 in “travel, food, auto operations, fuel & utilities” include, and why does it only start in 2020? What do “contractual services” include and why do they only go for two years, and end in 2020? $58 million is close to the $56.4 million that DPW expects to pay for the initial expansion of the Quarantine Road Landfill, which was already in the works before there was a Baltimore Clean Air Act. This expenditure was already anticipated when it was expected that Wheelabrator would stay open for many more years (to handle the incinerator’s ash). Day to day operations: Most of the revenue from Wheelabrator goes to the general fund. Yes, but this isn’t a one-way street. Wheelabrator admitted to us that the city pays them about as much as they pay the city. The city sets aside around $11 million per year to pay Wheelabrator in tipping fees, which also come out of the general fund. Using the city’s public landfill, and cutting out Wheelabrator, will be cheaper over time, and will also save people on health costs, increase productivity, lower pollution, and create more jobs. With a Zero Waste plan, reuse, recycling, and composting, can save (and even make!) the city money. DPW would have to spend “$110 million/year for expanded and new landfill [sic] and transfer station facilities.” The landfill expansion was already needed due to it filling up with Wheelabrator’s ash. DPW has been working on permitting this expansion for a few years now. There should not be any need for new transfer facilities. Five transfer stations are already in use for the city’s waste, three of which are in other counties. Most of the city’s waste won’t need to be transferred in the first place. Only 3.3% was brought to transfer stations in 2017, down from 9.4% in 2016. 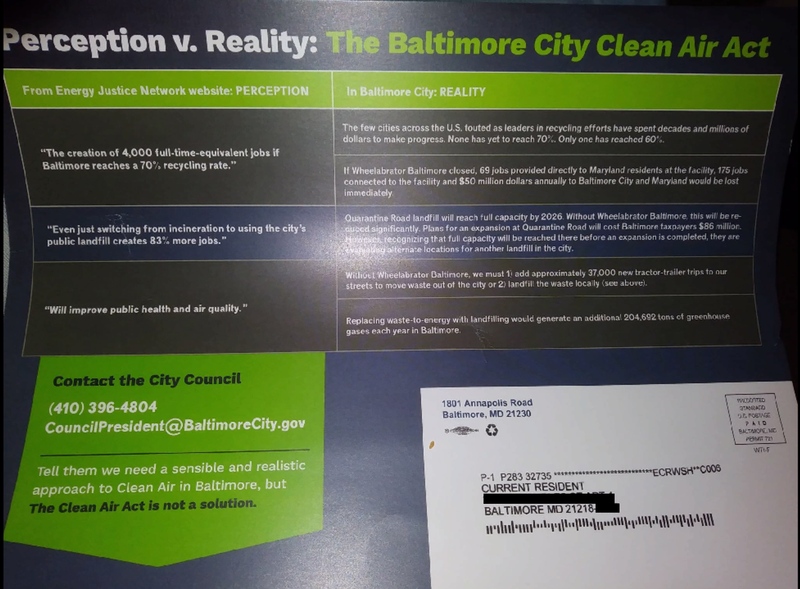 The Baltimore Clean Air Act imposes unrealistic and duplicative regulations…. It’s “unrealistic” because the 34 year old Wheelabrator incinerator is a dinosaur that can’t easily upgrade, so they claim. However, other facilities in the U.S. and Canada are meeting the limits required by the Baltimore Clean Air Act. 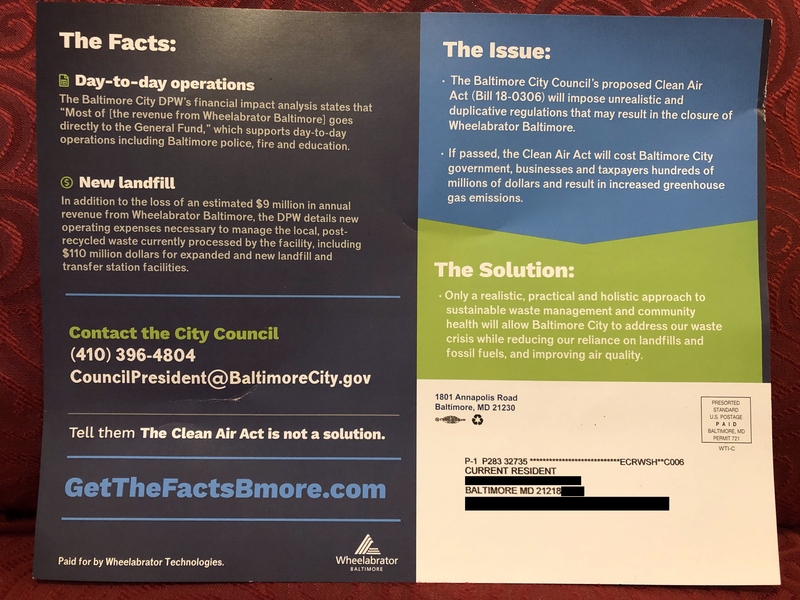 Others that have been proposed in recent years in Baltimore (Energy Answers) and in Frederick, MD (a Wheelabrator proposal) would have had to meet some of the same standards Baltimore City Council is seeking to protect Baltimore residents. These standards are not duplicative. Current state regulations require no continuous monitoring for 16 of the 20 pollutants in the Act. No regulations require Wheelabrator to make their air pollution data easily and publicly available on a website as Montgomery County, MD and Fairfax County, VA residents are entitled to see. Finally, the emissions standards are more protective than the state and federal minimums. 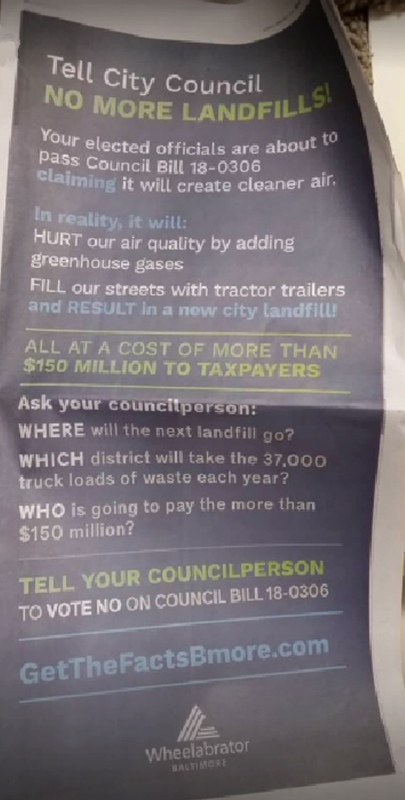 Will cost hundreds of millions… Actually, incineration (and dumping the ash in landfills) is far more expensive than direct landfilling, and minimizing waste through a Zero Waste plan will make the city’s landfill last much longer. Hundreds of millions have already been spent on burning trash at Wheelabrator. It’s time to save money on waste management AND save on health care bills. 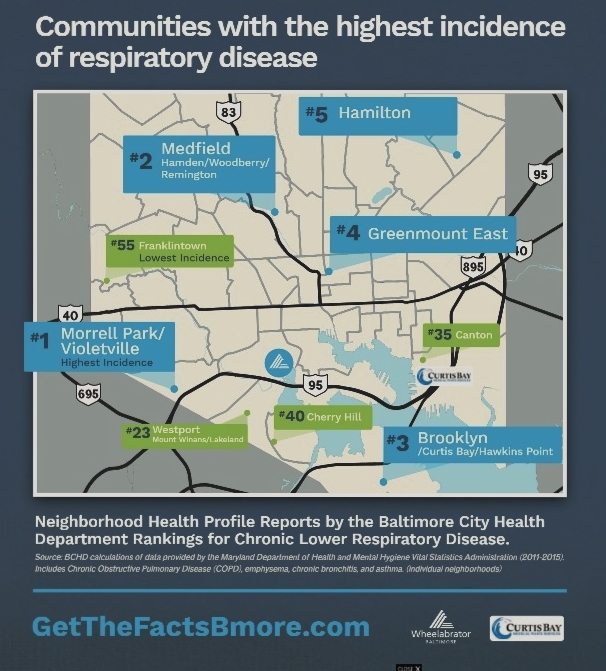 Asthma-induced medical costs and missed work and school contributes to $156 million in lost productivity each year in Baltimore, and Wheelabrator is the largest single contributor of nitrogen oxides (NOx) pollution that triggers asthma attacks in the city. …will increase greenhouse gas emissions. Not true. Incineration is worse than landfilling for the climate. See this addressed above. Redundant with first one. See above. 69 jobs at Wheelabrator and 175 jobs connected to the facility would be lost immediately. Nothing is immediate. Wheelabrator has until January 1, 2022 to comply with all of the measures of the Baltimore Clean Air Act. If they chose not to, and prefer to close down, there is time to transition in these next few years. Future legislation can ensure that the workers are retrained and given preferences for new reuse, recycling and composting jobs. Energy Justice Network has been advocating for the city to build its own recycling infrastructure that would be union jobs, unlike Wheelabrator. Another city-owned recycling center, in San Francisco, provides union jobs with a starting wage of $25/hour, equity in the company after one year, and hires from the community. This sort of model can exist in Baltimore, and would create about 10 times as many jobs as Wheelabrator does. “Quarantine Road Landfill will reach full capacity by 2026.” That’s true only if the city does nothing to reduce its waste. Adopting curbside composing collection, distributing free recycling bins, and other recycling incentives could easily double our waste diversion rate and stretch out the life of the landfill. “Plans for expansion at Quarantine Road will cost taxpayers $86 million.” The initial phase of the expansion of the city’s Quarantine Road Landfill is slated to cost $56.4 million according to a January 31, 2019 presentation by the Department of Public Works to Baltimore’s Planning Commission. “Recognizing that full capacity will be reached there before an expansion is completed, they are evaluating alternative locations for another landfill in the city.” At the January 31, 2019 DPW presentation to Baltimore’s Planning Commission, DPW Director Rudy Chow stated that he believed that the state has a moratorium on permits for new or expanded landfills, per Governor O’Malley’s Executive Order, and that the Quarantine Road Landfill expansion permit application was submitted just in time prior to that. While he didn’t seem to know that Governor Hogan rescinded that order, this makes it clear that DPW has not been trying to look for other landfill sites. It also makes no sense that they would when DPW has been working for a few years on their landfill expansion permit, and there aren’t major unpopulated parts of the city where other landfills would make any sense. Finally, if the city were looking for new landfill locations, it would surely be part of the Solid Waste Master Plan study which $450,000 is being spent on. This study is exploring many options, including new incinerators, privatizing the landfill, filling it up quickly on purpose, and other awful ideas that City Council has unanimously criticized in a resolution adopted in May 2018. “Without Wheelabrator Baltimore, we must 1) add approximately 37,000 new tractor-trailer trips to our streets to move waste out of the city or 2) landfill the waste locally.” Closing Wheelabrator would mean LESS truck traffic, because 46% of the trash they burn is from outside of the city, and would no longer be coming to Baltimore. Also, by going straight to the landfill, there’s no need to truck to the incinerator, then truck ash to the landfill. Small amounts of Baltimore waste already leave the city through five transfer stations. There is no reason to believe that this would increase, or that it would increase truck trips in the city in any case. Replacing waste-to-energy with landfilling would generate an additional 204,692 tons of greenhouse gases each year in Baltimore. Simply untrue. Even if the city had no landfill and had to truck all of its waste to a landfill in southeastern Virginia, incinerating in Baltimore would still be far worse for the climate. This has been documented in a life cycle analysis. Addressed above. There will be a reduction in greenhouse gases if incineration is stopped. Fill our streets with tractor trailers and result in a new city landfill. Addressed above. There will be a reduction of trucks on Baltimore’s roads if we stop trucking in trash from outside of the city to burn, and no longer have to haul ash from the incinerator to a landfill. Where will next landfill go? There is no “next landfill.” Just an expansion of the existing one, in an unpopulated section of the city. Which district will take the 37,000 truck loads of waste each year? None, because there is no increase. Waste trucking will continue to serve all districts of the city. Who is going to pay the more than $150 million? This amount hasn’t been documented and seems to be little more than a scare tactic. All told, the city will save money by moving away from incineration. The biggest short-term cost is a landfill expansion that was already in the works to accommodate the incinerator’s ash. Asthma stats We never made the claim they claim we claimed. Straw man argument. Their air pollution travels quite far. A 2017 study, however, shows that just one of the many pollutants released from Wheelabrator, fine particulate matter (PM2.5), has been calculated to cause $21.8 million in annual health damage to Maryland residents each year from respiratory problems, plus another $33 million per year to residents in six other states. This unsupported fiction is debunked above. Maryland Department of the Environment figures show the city generated more waste and recycled less in 2017 than 2016. Have even more questions? Please be in touch!